While this film’s title may suggest numerous settings and a large cast, this dramedy by writer-director James C. Strouse (Grace is Gone, 2007) is really a snapshot into the lives of a few people who are struggling with careers and evolving relationships. People, Places, Things stars Jemaine Clement (Muppets Most Wanted, 2014) as Will Henry, a graphic novelist and professor whose life just hit rock bottom. During his twin girls’ fifth birthday party, he accidently walks in on his wife, Charlie (Stephanie Allynne, In A World, 2013) cheating on him with another man named Gary (Michael Chernus, Captain Phillips, 2013). Before the cheating pair can get fully dressed, Charlie admits she’s unhappy and demands a divorce on the spot. A year later, Will, now single, must balance the challenge of trying to raise his adorable identical twin daughters, a classroom full of art students with varying attention spans, and his lonely life in an Astoria studio apartment. To blow off steam, Will draws sequences of cartoon characters depicting dark scenarios of frustration and loneliness until the late hours of the night. One day, a student (Jessica Williams, Hot Tub Time Machine 2, 2015) challenges Will to pursue new people, places and well, things – including her single mother, Diane (Regina Hall, Think Like a Man Too, 2014). After much hesitation, Will agrees to go on the date, and although the night does not go very smoothly, the two develop a mutual respect and attraction for each other. Of course, nothing can be that simple for Will as Charlie, his ex, continues to hinder his ability to move on with his life with her panicked phone calls and wavering feelings about her new relationship. He must juggle trying to be there for his daughters, his job and his writing. There are no hidden symbolisms or deep concepts to grasp in People, Places, Things. It’s simply a window into the complexities of modern life and relationships featuring a struggling middle-aged man who is trying to juggle a full plate and still find happiness. The topics presented in Will’s comic classes are interesting and certainly thought provoking. For instance, the discussion of how students should “respect that gap between panels” describes how one shouldn’t assume a scenario based on a series of separate photos as they could very well be independent of one another. The clever and mostly understated dialogue is sprinkled with witty one-liners, which helps to keep audiences on their toes, even if it takes a second to digest the pun. Some may find the film slow or mundane, but they also shouldn’t expect a stereotypical “Hollywood” script in the first place. Strouse doesn’t glamorize any aspects of the film, and it has a naturalistic visual style. Clement’s innocent and nerdy character is quite delightful, and some audiences may draw the valid comparisons to his character in the HBO series, Flight of the Conchords. However, Clement really shines in the film as a devoted father, a role most audiences may not expect from him. His twin daughters played by Gia and Aundrea Gadsby are utterly adorable and will certainly have roles lined up in their future. Allynne played her paranoid, organized, yet lost role well, although it felt as though she was miscast. It seemed unlikely that she’d be interested in either Will or Gary. The ‘places’ reference in the title is also a bit confusing as the limited New York ‘scenery’ wasn’t necessarily memorable, nor does Will travel much outside of the state. People, Places, Things made its world premiere at the 2015 Sundance Film Festival. The Film Arcade has picked up the U.S. rights, and the film will be available this summer. Bottom-Line? People, Places, Things is a naturalistic dramedy that’s sweet, engaging and a little drab at times. 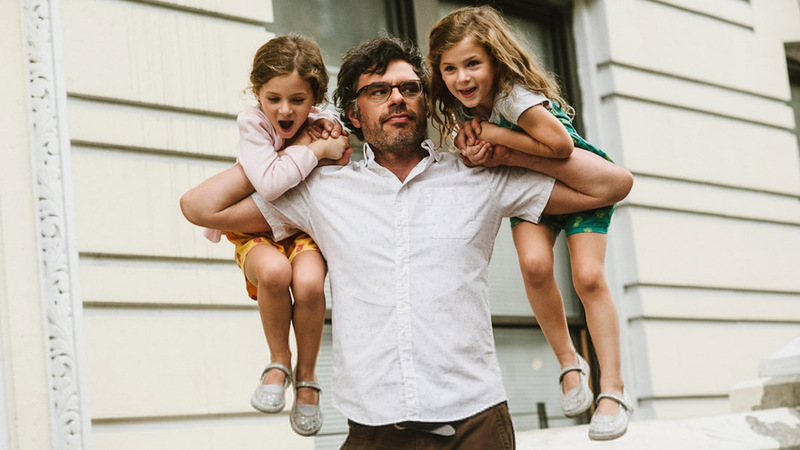 Despite his struggles as a single father, Jemaine Clement’s character is a delight as well as his adorable twin daughters.